Michael Robertson loves to talk, except to shareholders. At the time of my resignation, in an effort to save the company (which I was certain Robertson would destroy in short order), I offered to purchase control of the company by buying up stock for around $.50 a share (in cash). Robertson didn't even respond to my offer, and in under a year, the company was gone. Robertson tried to save face by saying he had sold the assets to Xandros in a back-room deal. 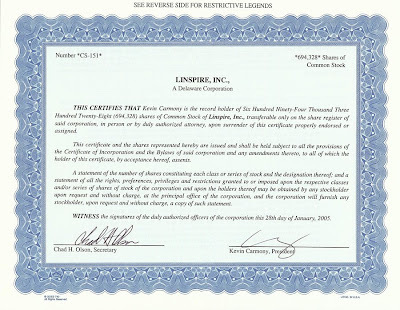 Knowing this was a sham, and that Linspire stock was now worthless, I offered to let Robertson purchase my shares for ONE FIFTH of what I had offered to buy it for only ten months prior ($.10 per share). Of course, he knew the company wasn't worth anything and didn't accept the offer. So, here we are, two years later, and around 100 shareholders have not heard what happened to their investment in Linspire. Anyone thinking of investing in Robertson should look carefully at how he has treated the Linspire shareholders, employees, customers, partners, etc. 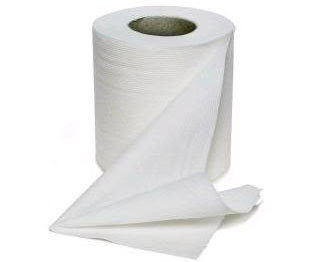 Below is some toilet paper I purchased yesterday and a copy of my Linspire stock certificate. Can you guess which one is worth more? At least the toilet paper is twin-ply, soft and absorbent. 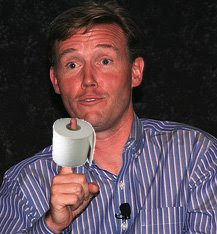 I had offered to BUY Linspire shares at $.50 per share, and in the blink of an eye, Robertson had turned it into less than the value of a roll of toilet paper. Greedy, unethical AND incompetent. No wonder he's a coward to face the shareholders. It's nice to see the truth about Robertson getting out there. Those like me who have had the misfortune of working with him know he's a creep, but others should know as well. How in the world has this absolute tragedy been allowed to continue & fester for this length of time? This situation is so outrageous and unscrupulous that it simply BEGS coverage. Where are the news crews? Has anyone tried to interview MR and been declined? Even that would be reportable news. What happened to the class-action lawsuit begun some time back? How can MR get away with this? It could simply be that the group affected is considered too small to be deemed news-worthy or of, 'immediate,'concern to the legal system or financial watch-dogs. I wish someone such as yourself would find a way to get this featured on one of the national [nightly] news programs. Thanks again, Kevin. Your views are always welcome and I appreciate the efforts you've taken to keep this issue alive. Because Robertson hasn't done anything news worthy for years, he's not well known nationally. The national news might have cared ten years ago, back in the MP3.com days when Robertson was losing the largest copyright infringement case in history (see my previous blog), but he's been pretty much irrelevant on the national scene ever since. This is why most of Robertson's blogs are him poking fun at all the SUCCESSFUL companies who have succeeded where he has failed, like Apple, Skype, Lala, Pandora, etc., hoping someone will care (they don't). The only reason I cover him here is for those who may be thinking of working for him, investing in him, and so on. I gave up ever seeing a penny from my Linspire work years ago (I knew when Robertson turned down my offer to take control the company would crater), but I feel an obligation to make sure others don't befall the same fate as his former employees, investors, customers, etc. There IS an ongoing lawsuit against him and Larry Kettler, trying to get them to explain what happened, but of course, he'll continue to drag that out forever. He's a coward, refusing to meet with shareholders. I'd have more respect for him if he'd just meet with shareholders, admit his company failed under his direction, and explain that he and his father-in-law took the remaining cash because they were "preferred" shareholders. But, he's a coward, and as I've said all along, it will take the current litigation for him to do anything. Fine, but I'm sure VCs and investors are paying attention. Robertson and his wife even purged his wikipedia entry recently, removing the many negative items, trying to rewrite his sorry history. Someone has to make sure the truth gets out there. When he called my good friends embezzlers for accepting severance payments, that was the final straw for me, and I felt I had to stand up and speak out. Most are afraid of speaking out honestly about Robertson, because like most cowards, they try to bully others, and Robertson likes to use our court system to do his bullying. He's filed two silly (frivolous is too kind a word for these dogs) lawsuits against me, to keep me quiet. He clearly doesn't understand how I'm built. That will just guarantee I make sure everyone knows the REAL Michael Robertson. The fact that it has been over two years now without the shareholders having their day in court damages my trust in the whole system even more than it already was. Sure sometimes things like this should take some time (to get paperwork together and go through it with a fine toothed comb, etc) but over two years?!? I agree Carl. Says a lot about Robertson's lack of ethics as well as the slow hand of justice. The courts I understand, we know they are slow, but how Robertson can sleep at night having stiffed 100 shareholders without any information, that's another matter all together. The good news is that Robertson's reputation is finally catching up with him. I can't imagine anyone investing in him going forward. All they have to do is talk with anyone who's done business with him in the past.